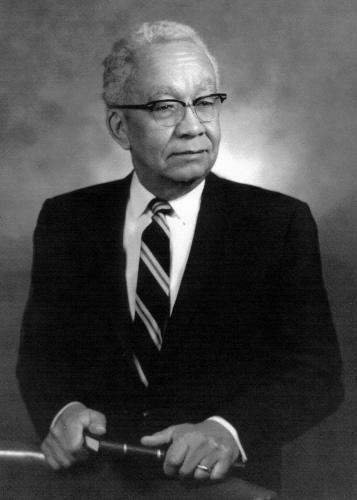 A native of Tuskegee, Alabama, Nathaniel Olgesby Calloway was a pioneer in the field of chemistry. As a child growing up in Tuskegee, he spent time with George Washington Carver, a well-known soil chemist and faculty member at Tuskegee Institute (now Tuskegee University). In 1930, Calloway earned a B.S. degree in chemistry from Iowa State University. Three years later, he became the first African American to earn a Ph.D. in chemistry from Iowa State University. As a graduate student in the Department of Chemistry at Iowa State University, Calloway studied synthetic organic chemistry, a branch of chemistry that focuses on compounds that contain the element carbon. Calloway’s Ph.D. adviser was Henry Gilman, a well-known organic chemistry professor at Iowa State University. Gilman actively recruited African American chemistry majors from Historically Black Colleges and Universities (HBCUs) such as Fisk University and Tuskegee University to pursue doctorates at ISU. After completing his doctoral studies at Iowa State University, Calloway accepted a faculty position in the Department of Chemistry at Fisk University. As a faculty member, Calloway was a very successful researcher, publishing several peer-reviewed articles in top chemistry journals such as the Journal of the American Chemical Society. Remarkably, Calloway continued his passion for knowledge and discovery and earned his M.D. degree from the University of Chicago in 1943. Subsequently, Calloway served as an assistant professor at the University of Illinois Medical School and worked as a practicing physician. Calloway also helped to establish the Medical Associates Clinic in Chicago. Sibrina Collins, "The Gilman Pipeline: A Historical Perspective of African American Ph.D. Chemists from Iowa State University,” in Patricia Thiel, ed., Chemistry at Iowa State: Some Historical Accounts of the Early Years (Ames: Iowa State University, 2006); Henry Gilman Papers, University Archives, Iowa State University Library. Sibrina Collins, “The Gilman Pipeline: A Historical Perspective of African American Ph.D. Chemists from Iowa State University,” in Patricia Thiel, ed., Chemistry at Iowa State: Some Historical Accounts of the Early Years (Ames: Iowa State University, 2006); Henry Gilman Papers, University Archives, Iowa State University Library.